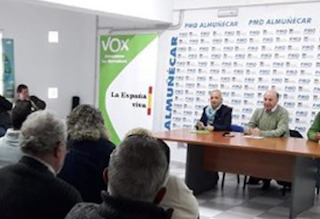 The new, far-right, political formation in Almuñécar, Vox, has hit out at the Vice Mayor of Almuñécar, Juan José Ruiz Joya (PP) over reference to a Pacto de Vergüenza (Pact of Shame). Sr. Ruiz Joya had used the expression to described an alleged silence from other parties concerning the recently disclosed, supposed, corruption affair, dating back to 2005 when Juan Carlos Benavides was the Mayor. This new party, which will take part in the municipal elections for the first time on the 26th of May, laments that no sooner as the municipal elections haul into sight then the established political parties begin ‘throwing muck’ at each other. Vox highlights that it is a new party with no loyalty other than “to the nation and its citizens.” Neither does it have any ‘political baggage,’ unlike the older parties, it considers. With respect to the alleged case of corruption during Benavides’ time in the mayoralty, Vox said that it was not going to make any kind of comment, as, they consider, it is a judicial affair for a judge to sort out. They said that as their political formation did not exist back then, it obviously had nothing to do with it either. This entry was posted on Thursday, February 7th, 2019 at 8:54 am	and is filed under Almuñécar. You can follow any responses to this entry through the RSS 2.0 feed.